Dr. Mohebi’s lecture on more effective FUE methods inspired others who talked about introducing these cutting edge techniques at their hair restoration centers. Dr. Mohebi’s experience as chairman of the FUE Research Committee has allowed him the ability to participate in several new studies that redefine what is possible with modern technology. Dr. Mohebi stated, “We have been witnessing the emergence of a variety of FUE devices that facilitate extraction and implantation of hair follicular grafts. 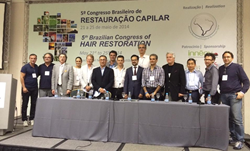 What we have done was several studies at US Hair Restoration Centers that compare the quality and efficiency of new FUE procedures with the results of more traditional procedures.” Other audience members echoed the doctor’s sentiments, believing that the level of innovation seen these past few years rival the changes introduced shortly after Follicular Unit Extraction started becoming more popular in the late nineties. The doctor described his experience when asked about what he most looks forward to when traveling the world, “I love the experience of traveling and sharing what we learned through research and innovation at our centers in Southern California. Dr. Mohebi enjoyed presenting these latest findings to an audience interested in new possibilities arising out of FUE research. Dr. Mohebi believes that adoption of these new methods will help doctors around the world treat patients for varying degrees of hair loss. The doctor’s commitment to improving education on FUE procedures has already helped hundreds of young professionals advise their patients on surgical requirements for FUE. This procedure has continued to help thousands of patients with limited donor hair on their scalp achieve stunning results they never imagined possible. As chairman of the FUE Research Committee and creator of several methods and techniques in modern hair restoration, Dr. Mohebi and his staff provide the most advanced techniques in this industry. Dr. Mohebi prides himself in advancing new research and developing the latest technology to improve the quality of hair restoration. The overall goal at his office is to restore patient’s self-esteem through the use of quality hair restoration techniques.